Repositioning refurbished shipping containers as retail spaces and offices for creative startups, The Artworks Elephant turns Elephant and Castle into "the new Shoreditch", according to the Evening Standard. The five year project, which began in 2014, includes cafes, bars and street food traders as well as an old vintage style barbers shop and a temporary Library for Southwark Council. There's food from Jay Jays Deli, Tasty Jerk Caribbean takeaway and Six-Yard Box, a continental style table-football cafe. Classes at Union City Osteopathy and Yoga Studio include core strength Yoga, Pilates and baby massage and there are two treatment rooms offering health advice, acupuncture and osteopathy. On the top floor of the Artworks, a new temporary community library gives local residents access to a library while proposals for Walworth Town Hall and Newington Library are in progress. Once the temporary site comes down, the plan is for successful Artworks tenants to move into the new spaces at Elephant Park, a major part of the Elephant and Castle regeneration. What are the best dining options near The Artworks Elephant London? The Artworks Elephant gyms, sporting activities, health & beauty and fitness. 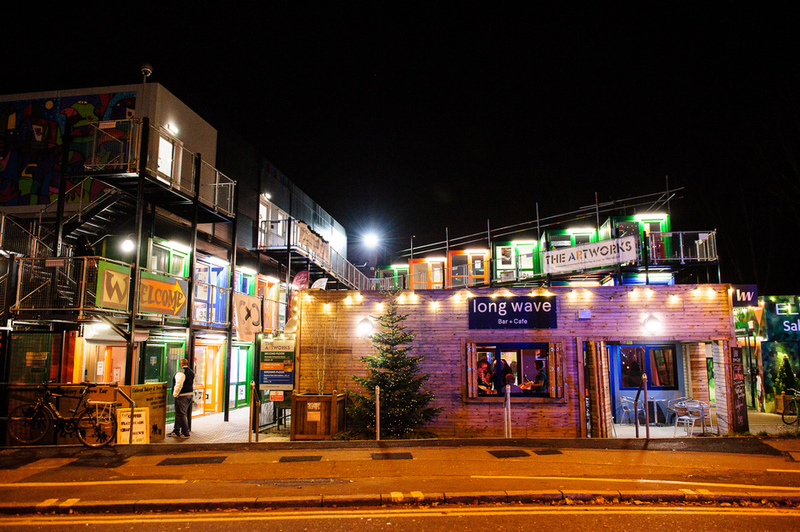 The best pubs near London The Artworks Elephant. The Artworks Elephant clubs, bars, cabaret nights, casinos and interesting nightlife. Where to have your meeting, conference, exhibition, private dining or training course near The Artworks Elephant. From cheap budget accommodation to luxury 5 star hotels see our discounts for The Artworks Elephant hotels, including Days Hotel London Waterloo from 93% off.